Michael Wolff, the author of a new book that gives a behind-the-scenes account of the White House, defended his work Friday, insisting he spoke with President Donald Trump on the record and calling the commander in chief "a man who has less credibility than, perhaps, anyone who has ever walked on earth." 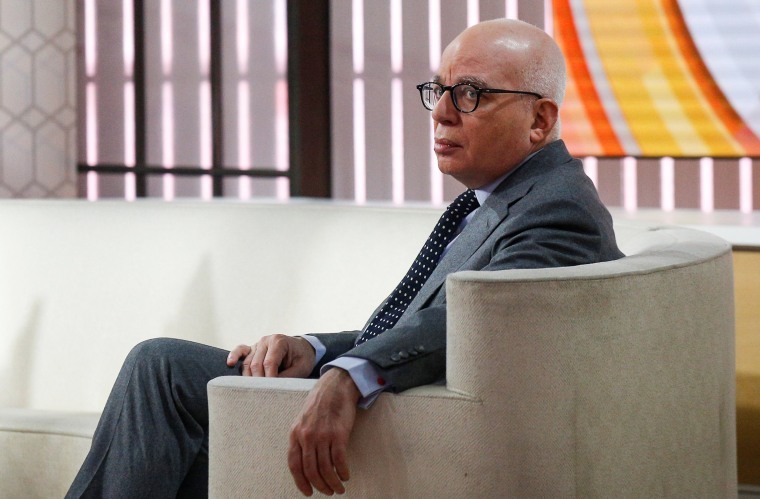 Wolff, in an exclusive interview on NBC's "Today," said that everyone he spoke to for the book, "Fire and Fury: Inside the Trump White House," described the president the same way. "I will tell you the one description that everyone gave, everyone has in common: They all say he is like a child," Wolff explained. "And what they mean by that is, he has a need for immediate gratification. It is all about him." Wolff added that "100 percent of the people around" Trump, "senior advisers, family members, every single one of them, questions his intelligence and fitness for office." Trump hit back in a tweet late on Friday, claiming Wolff made up stories and used his former chief strategist "Sloppy Steve Bannon" to sell the book. Wolff also contended that he "absolutely" spoke to the president during his reporting of the book. "Whether he realized it was an interview or not, I don’t know, but it certainly was not off the record," Wolff said. "I spoke to him after the inauguration, yes. And I had spoken to, I mean I spent about three hours with the president over the course of the campaign and in the White House, so my window into Donald Trump is pretty significant." Trump, however, said on Twitter Thursday night that he "authorized Zero access to White House" for the author and "never spoke to him for book." Responding to Trump, Wolff said Friday that Trump isn't one to talk when it comes to credibility. Wolff added that he has the evidence to back up his work. "I work like every journalist works so I have recordings, I have notes," Wolff said. "I am certainly and absolutely in every way comfortable with everything I’ve reported in this book." "Fire and Fury" features behind-the-scenes anecdotes from Trump's White House, including details on how the most powerful men and women in Washington worked to make Trump president — and then turned on one another after he took the oath of office. “Actually there’s a competition to sort of get to the bottom line here of who this man is. Let’s remember, this man does not read, does not listen. So he’s like a pinball, just shooting off the sides,” Wolff said. Wolff also revealed how people around the president noticed an apparent decline in his mental stamina. “In the beginning, it was like every 25 or 30 minutes, you would get the same three stories repeated," Wolff said about Trump. "Now it’s the same three stories in every 10 minutes." Wolff was then asked to elaborate on an anecdote he described in an article in The Hollywood Reporter this week in which he said Trump, at his Mar-a-Lago resort in Florida over the winter holiday break, didn't recognize old friends. "I will quote Steve Bannon — he’s lost it," Wolff said, referring to Trump's former strategist. White House Press Secretary Sarah Huckabee Sanders, appearing on Fox News Friday morning, said it was "outrageous to make these types of accusations" about Trump's mental health. It's "sad that people are going and making these desperate attempts to attack the president," she added. Widely reported excerpts from the book have roiled Washington, including claims from Bannon that Donald Trump Jr.'s meeting with Russians at Trump Tower in June 2016 was "treasonous" and "unpatriotic." The president apparently referred to Bannon as "Sloppy Steve," on Twitter Thursday night. On Friday afternoon, as he left the White House for a weekend at Camp David, he ignored shouted questions from reporters about whether he had read the book himself yet. Wolff’s book was released early Friday by Henry Holt, which announced a day earlier that it was pushing up the publication date due to demand. Earlier Thursday, Trump attorney Charles Harder demanded in a letter sent to Wolff and his publisher that the book not be published or disseminated. The book reached No. 1 on the Amazon best-seller list Wednesday. A copy of the letter obtained by NBC News cites defamation, libel and "actual malice" among the alleged wrongdoings in the book. NBC News has not confirmed much of the book. Wolff has been accused in the past of suspect reporting, most notably in his 1998 book "Burn Rate." In its review, the now-defunct media journal Brill's Content cited 13 people depicted in the book as saying that Wolff invented or changed quotations and that they couldn't recall his taking any notes or recording their interviews.